It’s time for the Card of the Week, featuring a new MP from Heroes and Villains. Let’s take a look at Nappa. If Nappa loves one thing, it’s killing allies. Nappa level 1 gets down to his roots – straight up ally killin’. He’s also one of the few MPs to begin the game with a physical attack. When paired with Black Devious Mastery, it becomes a reliable poke for 4 stages and 1 Life Card. On Level 2, he is able to deny your opponent stages regardless of defense. 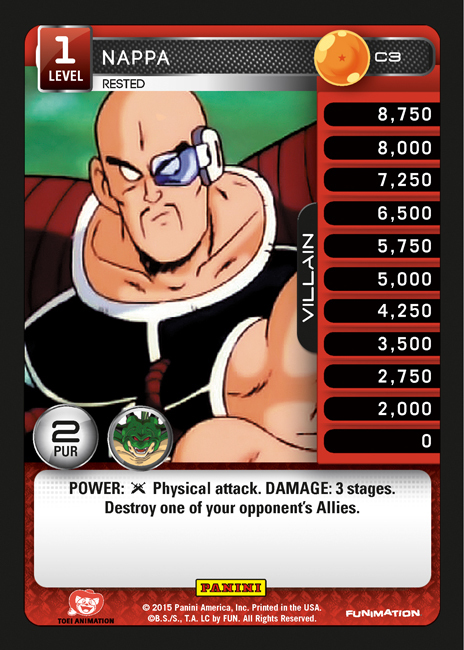 Red decks using Nappa might string together a large turn whenever they drop down to Nappa – Smirking. His Power on Level 3 is a sizable attack, and the HIT effect is an additional element of board control. Finally, his Level 4 can quickly end the game with high damage attacks that ignore Endurance. Saiyan decks and their rapid anger gain are well positioned to take advantage of this Power. 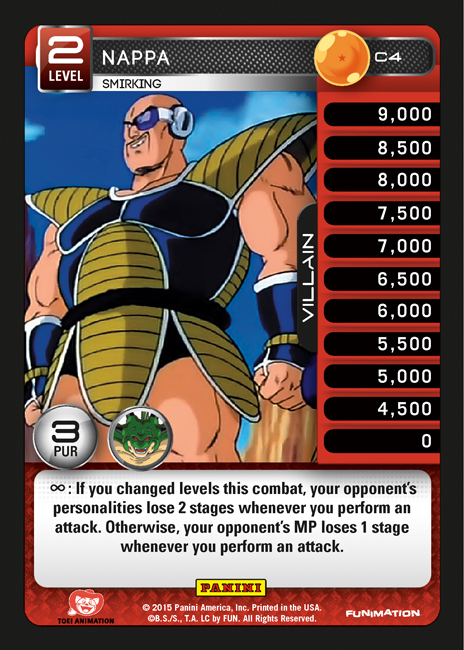 Nappa’s named cards provide even more interesting options. Nappa’s Energized Charge does a significant amount of damage, while also ensuring that an opponent will not be able to refresh stages by advancing a Level. It also has combo potential, such as pairing it with It’s Over 9,000! or Blue Overpowering Drill. Nappa’s Confidence gives you access to even more guaranteed stage loss, which can be devastating to decks running a high count of energy attacks. 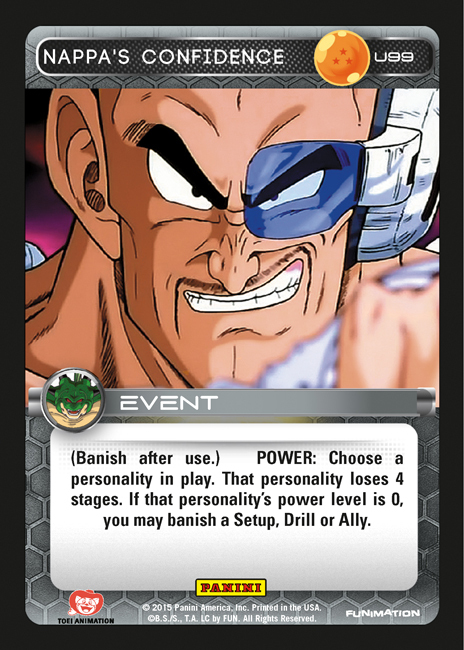 It also makes Nappa the first character to have a removal effect on a Named card, making him an ideal candidate for any Style that is lacking in that department. Nice! So much more playable then he ever was in the old game. Will be interesting to see how the meta shapes up. If Captain keeps showing up, expect to see a lot of Nappa to counter it. His level 1 even gets around Ginyu lv 3 and 4 protection. Very nice. 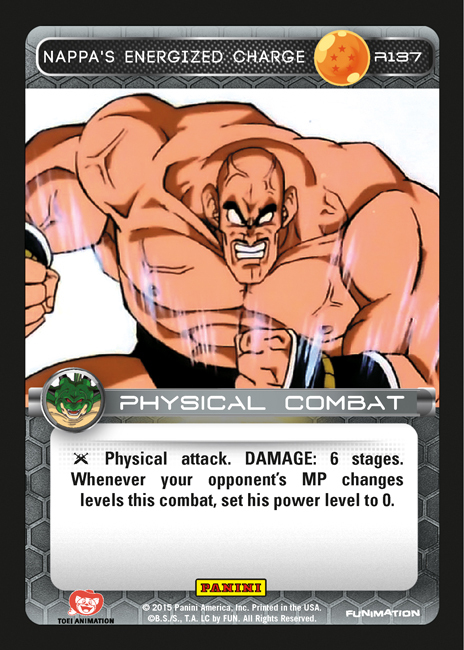 Nappa looks really bad on paper. I have a feeling that he’s gonna have to stick to blue or saiyan, since they have the most beefy physicals and his attack table is pretty bullocks. He’s also almost completely dependant on your opponents deck, Which is really bad. Any allyless deck like sdcc Black/Blue Krillin, Namekian Piccolo, Orange/Black Goku, Red/Saiyan Vegeta can destroy Nappa all day. All those physicals and stage loss cards with Black Targeting Drill. Mmhmm. He gives Black that board removal is lacks. Is anyone else noticing a pattern here? One has to wonder is anyone will ever play Ginyu again. The biggest problem I see is that he seems to be very physically based but his power level is quite low. Most stage 2’s have as much if not more compared to his stage 4. Don’t know if this will be a huge problem or not.